A tenor saxophonist best known for being part of Woody Herman's Second Herd section alongside Stan Getz, Zoot Sims, and Serge Chaloff. He is the sole surviving member of the original Four Brothers. He has few CDs in circulation in the US but made a comeback with Japanese independent label Marshmallow Records in 1992 with an album "Herbie's Here." 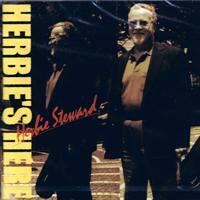 The Marshmallow catalog also includes a live album co-led by Steward and Sir Charles Thompson.